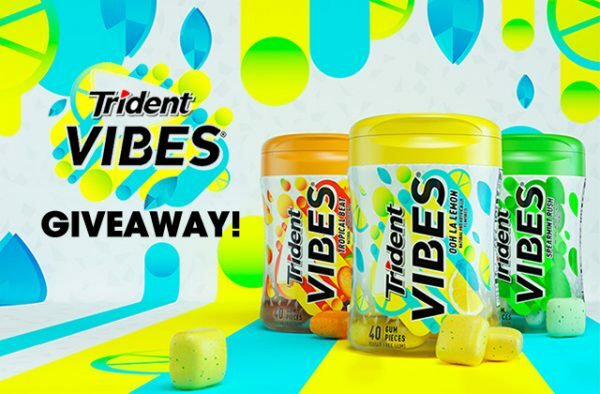 We are loving the delish bursts of flavour from NEW TRIDENT VIBES and we want to share the love! The light crystal coating and extra pops of flavour will keep you wanting more…good thing there’s 40 pieces in every bottle pack! SRP: $3.89 each. You’ve gotta try them all: Spearmint Rush, Ooh La Lemon and Tropical Beat! You could win two bottles of each flavour! Entering is easy! Check out our Faze socials and enter for your chance to win! Contest closes midnight July 16th, 2018. No purchase necessary. Competition open to residents of Canada excluding residents of Quebec. Entrants must be at least 13 years of age (or older if required by the laws of the province or state in which you reside.) Any unclaimed prizes will be forfeited after one month of the closing date. There is no substitution available and no cash alternative.